Create a breathtaking atmosphere in your own backyard with Airmax RGBW Color-Changing LED Light Sets. Now you can enjoy your Airmax EcoSeries™ or PondSeries™ Fountain at night and set the mood by changing the color including: white, blue, green, red and more. 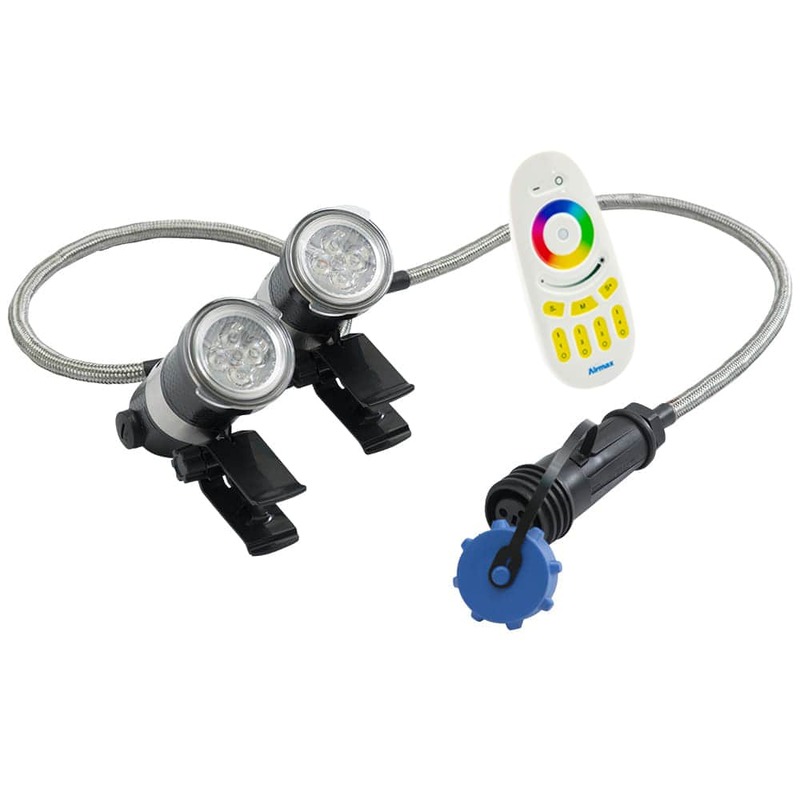 Wireless Remote - All light sets come with a wireless remote with a range of up to 200ft. One wireless remote allows you to control up to four light sets so you can dim/brighten lighting, change white lights to a variety of colors, control flash speed and run up to 9 preset programs. Design Features - All light sets include stainless-steel braiding on power lead and between light fixtures with an above waterline design for maximum output and low maintenance. 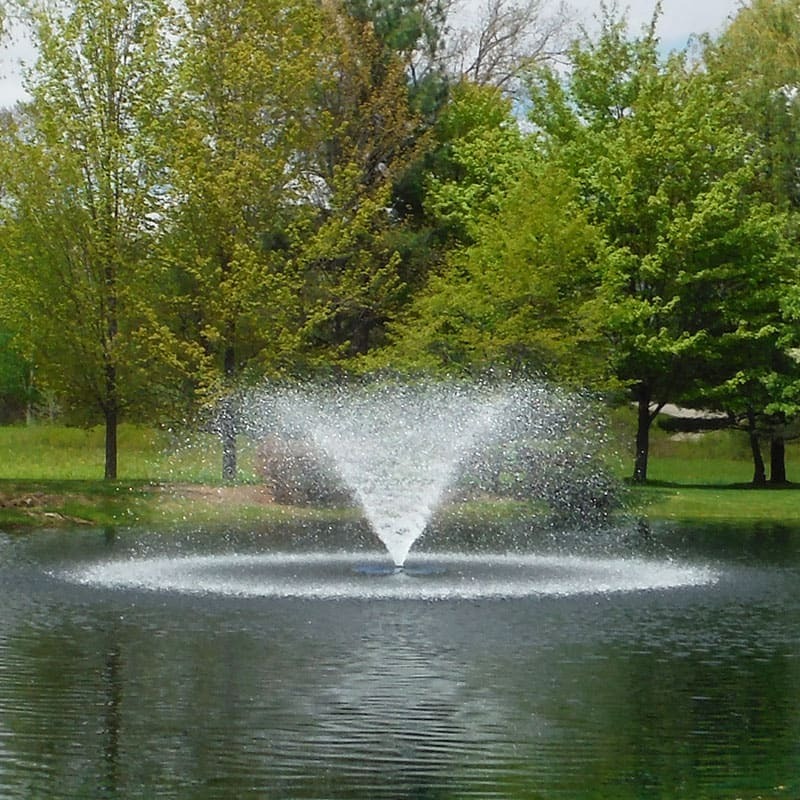 Each light fixture is fully adjustable and snaps on Airmax fountain floats without tools for quick installation without tools. Power Cords - All light sets come with an underwater disconnect, strain relief and 100' standard power cord. 150', 200', 250', 300', 350' and 400' power cord lengths are also available. For even more cord protection, power cords can be wrapped with PolyFlex and Stainless-Steel Braided protective sleeves. Watch the RGBW Color-Changing Product Videos to see the spray patterns in action. Download the operator's manual or illustrated parts list for your RGBW Color-Changing LED Light Set. Find genuine Airmax replacement or repair parts for your RGBW Color-Changing LED Light Set. Download the RGBW Color-Changing LED Light Set Warranty Sheet. The Airmax RGBW Color-Changing LED Light Set are designed to attach to Airmax fountain floats. Each light clips onto the float mounting positions. 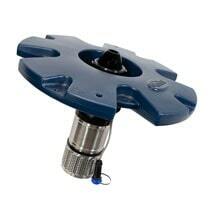 Secure each light with the included tension screw. Once the lights are attached to the float, connect the quick disconnect end to the power cord. Attach the light set power cord strain relief underneath the float mount ring. Adjust the lights to point in the desired direction. Connect the light set's power cord into a control panel or GFCI outlet. The Airmax RGBW Color-Changing LED Light Set is run by a wireless remote with a range of up to 200ft. The wireless remote allows you to change the color, dim/brighten the lights, control flash speed and run up to 9 preset programs. Your wireless remote has already been paired for your light set on Zone 1. • Press and Hold Master ON or ZONE ON for several seconds to turn all lights to white mode. • Touch the color ring to adjustment lights to any color. • Change the brightness by using the brightness slide ring. • Adjust flash speed for any preset program using the speed buttons.